With help from CTA, CABA has been able to build an e-commerce platform (www.cabacaribbean.com & www.mycaribbeanshop.com). CABA also has a social media platform (www.talkagri.com) and a programme that certifies basic agricultural skills (www.agri-educate.com). Most recently, CABA has established the Caribbean Agri-business Export Company (CABEXCO). Building an e-commerce platform is a long-term project and involves many components. How has CTA helped you build this platform? CTA has greatly assisted us in the establishment of this platform through the provision of technical and financial support. This support allowed us to establish a suite of tools, one of which is an e-commerce platform. We started by creating an online directory where businesses throughout the Caribbean can be listed and have their information shared globally. It has profiles for each of the over 400 and growing listings, where members can share detailed information about their firm, its capacity and structure. The e-commerce component, which was incorporated into the directory, is an online shopping platform that allows businesses to sell their products worldwide. Does the e-commerce platform target individuals or businesses? Anyone, anywhere in the world can access the goods sold on the platform. Be it an individual or business, CABA will work with you to become export ready to either sell your branded products through the platform or under our common regional brand. CABA has employed industry-leading technical consultants to assist us with the marketing and operation of the website as well as to build awareness around the services that we offer. How did CABEXCO come to be established? Initially we worked with 10 firms, through the ACP-EU TBT programme and CTA partnership, where technical support was provided to these firms to become HACCP (Hazard Analysis Critical Control Points) certified and organized for them an agribusiness forum to meet potential buyers. Being HACCP certified is key to accessing the export market. This group of 10 firms has now come together to be the initial members of CABEXCO. In January 2017, the board was elected and we will not begin the process of implementing the requisite logistics that will allow us to activate the e-commerce platform. CTA recently organised the Data4Ag week in The Hague in the Netherlands. What did you learn at the event? 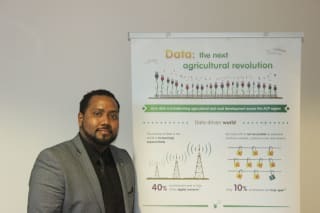 I learned of the extensive impact of data and its importance in the decision-making process, which enforces the direction our www.CABACaribbean.com and www.AgriCarib.org websites have taken to become a central repository for information for agribusiness stakeholders. The event, which was well hosted, also allowed me to network with fellow stakeholders and discuss opportunities for collaboration to advance agribusiness development, utilizing data facilitation as a key pillar in this process. I was also able to meet with Mrs Marissa Areli, from Women in Business Incorporated (WIBDI), where they have developed the Farm-to-table app with help from CTA, which links farmers to the markets and tourists and the tourists in turn to the farmers. We are now discussing the possibilities of creating a similar version for our website linking agro-processors and other agri-entrepreneurs to various stakeholders. In sub-Saharan Africa, the yield gap – the difference between a crop’s potential and the real yield – is often high, with many farmers harvesting 25% of the amount of maize, millet or other staple crop they could be getting, using the right information, technologies and inputs. This helps to explain why only 20% of the food produced in many African countries is sold, as smallholder farmers need to keep the rest just to feed themselves. Hence low incomes and widespread rural poverty. For many years now, most small-scale farmers in the Pacific Islands have struggled to make a decent living. The shift from the traditional diet of fish, fruit, indigenous tubers and fresh vegetables to one based on cheap, imported, calorie-dense foods not only reduced demand for local produce but led to major health problems, with the Pacific now suffering from some of the highest rates of diet-related diseases in the world. By helping to integrate farmers into markets, and providing exposure to more information and emerging innovations, farmers’ organisations (FOs) can contribute to boosting employment and incomes across the food value chain, as well as fostering more inclusive growth.